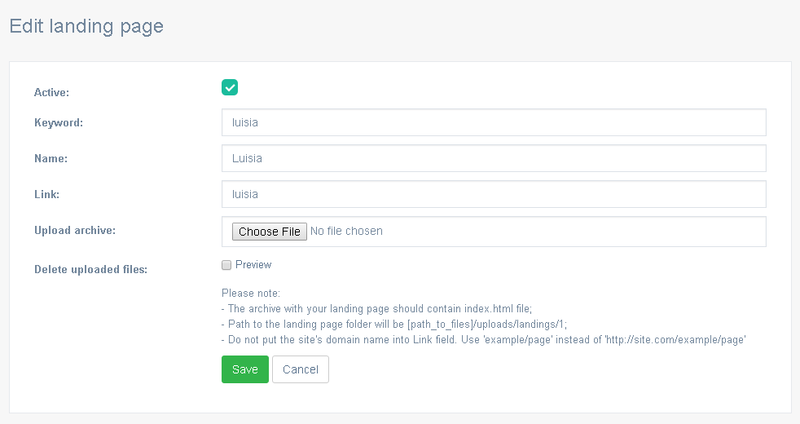 Landings add-on is a tool that will let you easily add and activate landing pages on your website. Click Add landing page and indicate the keyword, page name, and the part of the URL where you want the landing page to be located. Please note that you do not need to type in the full address into the ‘Link’ field. Upload the archive with the landing page files (ZIP format). The script will automatically replace site_url and site_path variables. Note 1: The archive with the landing page files should contain index.html file for the script to process it correctly. Note 2: Check the post_max_size and upload_max_filesize directives in php.ini to make sure that they will allow the upload of your ZIP archive with the landing page files. You may wish to check the memory_limit directive as well.